One big change CompTIA made to the 900-series A+ Exam objectives is fairly heavy coverage of Linux. This makes sense because you’ll encounter Linux quite a bit in business, especially in enterprise servers. LILO and GRUB are the two main boot loader packages used in Linux. Nowadays GRUB is used almost exclusively. In my experience, the most common cause for a Linux system “losing” its boot loader is when you attempt to dual-boot between Linux and Windows. In this case, Windows often removes the GRUB loader in order to replace it with its own. The good news is that you can easily re-enable GRUB. The specific instructions depend upon your Linux distribution, but the general procedure is to (1) start the computer from the Linux installation media; and (2) run a graphical or Terminal-based bootloader repair tool. 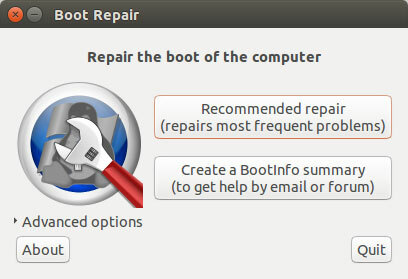 For example, in Ubuntu Linux you can easily install the GUI tool Boot-Repair (shown here) to re-install GRUB easily. Ubuntu Linux is known for being simple to use. Even re-installing the GRUB boot loader is easy, thanks to the Boot Repair tool. If a Linux system boots to the Terminal, you should verify that the system actually has a graphical environment like GNOME installed in the first place. Many Linux systems administrators, for example, refuse to load GUI shells on servers in order to keep the system running as “leanly and meanly” as possible. For most Linux distributions, you can manually start the graphical shell from a Terminal by running the startx command. What if your Linux system doesn’t have the graphical shell installed? You may need to configure an Ubuntu Linux system, but due to time pressures you need to at least temporarily load the graphical desktop to enact the repair. sudo: This stands for “superuser do,” and instructs Ubuntu to run the command as the superuser as opposed to a standard user. apt-get install: The Advanced Packaging Tool (apt) is one of the most popular Linux package managers. We use apt tools to find, install, maintain, and remove software, all from the command line. ubuntu-desktop: This is a single apt package that bundles the Ubuntu graphical desktop environment.